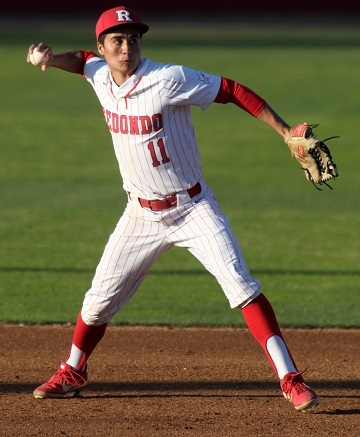 The baseball teams from Mira Costa and Redondo have wrapped up tournament play and will now concentrate on winning the Bay League title when the rival squads square off in a home-and-away series in the final week of the season. Redondo entered the week with a 15-6 record but must rebound from a three-game losing streak. The Sea Hawks are coming off a tough battle in the National Classic tournament where they won their opening game with a 5-3 victory over IMG Academy of Bradenton, Fla.
With one out and the bases loaded, Mason Grace hit a single to right field to score the winning run against IMG Academy. Max Zamarripa then walked to score an insurance run. Starting pitcher Drew Dalquist recorded eight strikeouts before Jake Thau got the final two outs for the save. Redondo then routed Jordan of Sandy, Utah 16-2 in the quarterfinals. Christian Dicochea slugged a home run and drove in four runs for Redondo, Brett McCauley hit a home run, Theo Forshey went 3 for 4 and Patrick Stark drove in three runs in the win. The Sea Hawks suffered a 4-2 loss to West Ranch in the semifinals and finished the tournament in 4th place after losing to Gahr 10-6 on Thursday. West Ranch won the tournament with a 2-1 victory over San Dimas. With little rest following the National Classic, Redondo lost to West Torrance 7-4 in a Redondo Tournament contest on Saturday when West scored three runs in the sixth inning to break a 4-4 tie. The Sea Hawks take on Palos Verdes in a home-and-away series yesterday and Friday, then play Peninsula on the road next Wednesday and at home the following Friday. Redondo’s home-and-away series with Mira Costa (Apr. 23-25) will determine the Bay League champion as teams then must wait for the playoff schedule to be announced. Redondo is in Division 2 while Mira Costa competes in the high-caliber Division 1. Palos Verdes and Peninsula entered the week with 2-2 records and are in Division 3. Following its Spring Break, Mira Costa played a tough West Torrance team on Tuesday after splitting a double-header with St. John Bosco last Saturday. In the first game, Christian Bodlovich limited the Braves to three hits while striking out nine in a 3-0 victory. Bodlovich, Chase Meidroth and Nick Carpino drove in the runs. In the second game, Mira Costa was shut out 2-0 despite starting pitcher Jared Karros allowing just five hits. On Tuesday, Mira Costa routed West Torrance 13-3 with Meidroth going 3 for 4 with a home run and four RBIs. Nick Bacura and Carpino each had two hits and two RBIs. The Mustangs will face Leuzinger and Centennial prior to their showdown with Redondo.